When you set out to search for the online casino that meets your standards you have a lot of things to consider. However, the very most important thing you need to be sure of before you join a casino is that it is going to offer you a very secure online casino gaming environment. You should never join any casino that you don’t feel completely secure with. If there are any doubts on your part then you should continue looking for a casino to join. The security is the top consideration you should be focusing your attention on. Once you have narrowed down your search to secure casinos you can begin going over the other features in order to choose that one which will meet your needs the best. When you join an online casino where you will be playing real money games you will be putting personal and financial information on this casino. 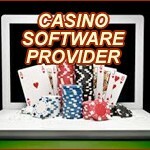 You need to be completely sure that the information you enter into the casino is going to remain safe and secure. The good news is most of the casinos you will find to play on have put security measures in place to protect you. However, it is your job to make sure you choose one of those reputable casinos that have gone to those lengths. Not only will you want to look for the securest casino possible so you know your information won’t be jeopardized, but you also want to know that you are going to be able to count on the casino to offer you an environment you can count on to continue offering you great gaming for a long time to come. If you join a casino that is not as secure as it should be then the casino itself will be at risk. This can lead to the casino going under and if this happens it can take your funds down with it. What makes a Secure Casino? 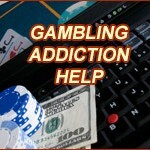 There are some specific things you want to look for in order to determine how secure an online casino is. The first thing that makes a casino secure is encryption technology which makes it difficult, if not impossible for a hacker to access the information in the database. This is extremely important for an online casino that has player information to keep safe. Since players will be entering such information as their name, address, and financial information such as their credit card information into the casino this information needs to be fully protected from hackers. You want to make sure the casino you join offers nothing less than 128-bit SSL (Secure Socket Layer) data encryption. 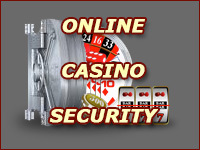 Anything less than this will not offer you the security you need when playing at an online casino. This information is usually found in casino’s Security & Privacy page. You also need to be sure that the online casino offers you secure banking options. One of the things you need to be aware of is not only does the casino need to offer you the utmost in security, but the deposit and withdrawal options also need to provide you with that same level of security. If you are unsure of a method you see available for your deposits or withdrawals, you need to verify it is also secure before you choose to use it for your transactions. Look for a casino which offers financial histories you can easily access. This way, you know the site is going to be able to do a complete audit if necessary which will be very helpful should any disagreements arise. 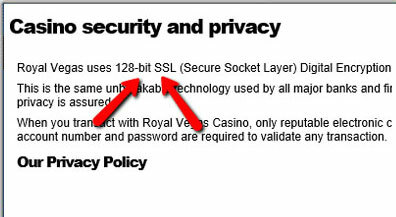 A sample of a casino’s Privacy page mentioning the SSL used. 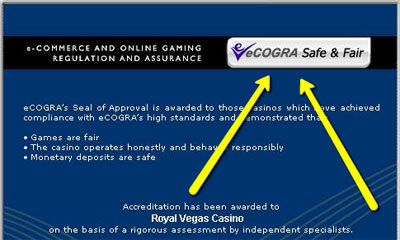 Another thing you want to look for when searching for a secure online casino is the eCOGRA seal of approval. This should also be located on the bottom portion of the casinos home page. Seeing this seal of approval on the casino shows you that the casino has been tested and approved by eCOGRA, a London-based internationally accredited testing agency that provides framework for best operational practice requirements. There are strict standards set in place regarding fair and responsible gambling. Continuous monitoring and onsite reviews are conducted in order to ensure a casino is meeting the standards. When an online casino has been approved by eCOGRA it shows that the casino has exhibited a higher level of quality and provides a dependable and fair gaming environment for its players. eCOGRA also a mediation service, who will help the online casino players fight for their rights. It is important for you to understand that joining a casino without the seal of approval doesn’t mean you are at risk, but it does mean if you run onto any problems you will not be able to turn to eCOGRA for help. 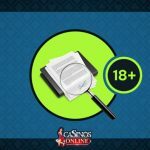 Look into the reputation of a casino by paying attention to what other online casino players think of it. You will learn a lot about a casino by listening to the players, hey are the ones who know firsthand which casino is good and which ones suffer from problems. You can read the reviews and forums in order to see how the players feel about the different casinos and the security they offer to their players. How eCogra’s Seal of Approval looks like. For Royal Vegas Casino. There are red flags you want to be aware of that will help you to spot the online casinos that may not offer you a level of security you can count on. There are also resources available to you online that you can count on to help you spot the casinos you may want to be a bit more leery of. 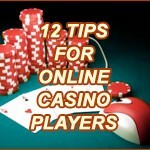 You will find online blacklists which will provide you with warnings of the online casinos that have seen problems. If you find a casino listed on this list then it is best that you avoid it and continue looking. Another red flag you want to look for is an online casino that doesn’t see a fair amount of traffic or doesn’t appear to update its site on a regular basis. When you are looking for a secure online casino the last thing you want to do is to join one that seems as if it is almost deserted. A secure casino will be one that gets a lot of attention from players and this will lead to it seeing a good amount of traffic regularly and it will also want to offer players the most up to date information. While it is important for you to pay attention to how secure a casino is, you also want to make sure you do your part to be safe while you are playing online. When you are playing at an online casino you may find yourself networking with other players. When you do this you want to make sure you do so in a secure manner. You never really know who is on the other end of the computer and you have no way of knowing their real motives. This is why you should never give anyone information about yourself that you are communicating with on the Internet. You also want to be aware and if you notice any warning signs at the casino you have chosen, don’t be afraid to look into things and set your mind at ease. When you join an online casino you need to remain cautious and continue to keep your eyes open for anything that looks wrong. Once you find the best casino that you know is going to offer you the most secure gaming environment possible, you will be able to log in to your account with confidence. You will be able to have a fantastic, carefree time in which you will enjoy a lot of games and chances to win. Make sure to follow the above tips so you know you are looking into the right areas and doing things in a manner that will offer you positive results. Many players set out to find their first casino without knowing exactly what to look for. Many times, these players end up looking for a better casino shortly after joining the first. You can avoid this by knowing what to look for and paying attention to the important things the first time around.